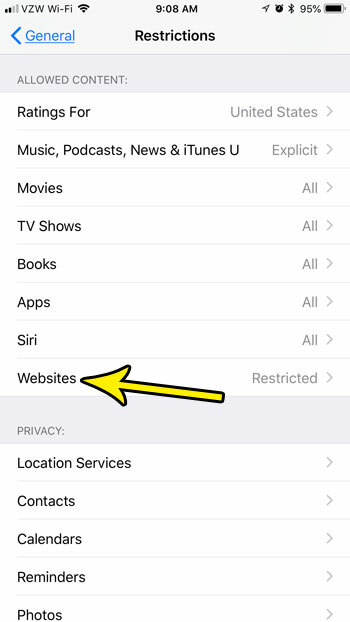 We have previously written about blocking websites on an iPhone, which is a great way to prevent children from visiting certain unwanted sites. It keeps most of the functionality of the device, while ensuring that they won’t be able to visit a site that you have deemed inappropriate or harmful. Unfortunately you may have blocked a site inadvertently, or you need to do something on a site that is currently blocked. 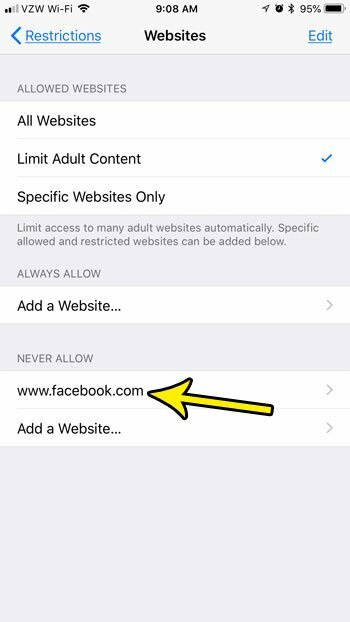 Luckily the sites that you block in the Restrictions menu aren’t blocked permanently, so you can add or remove sites from that list as needed. Our tutorial below will show you how to unblock a currently blocked website on an iPhone. 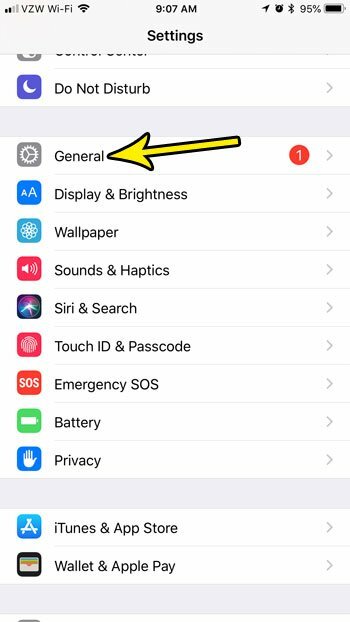 The steps in this article were performed on an iPhone 7 Plus in iOS 11.3. 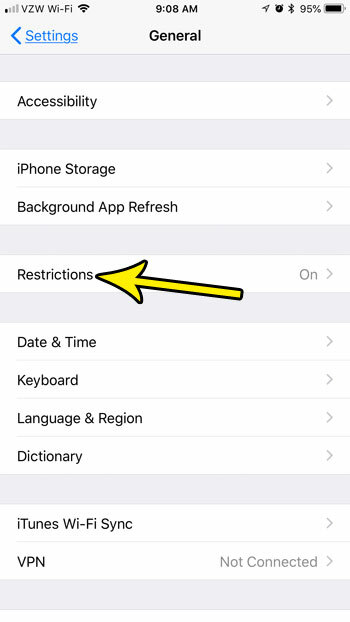 This guide assumes that you are currently unable to access a website from a Web browser on your iPhone, and that you are seeing a message in the browser that the site is restricted. Note that this will only work if the website is currently blocked using the Restrictions feature on the device. If the site is blocked in another way, such as through your network router, then you will need to speak to your network administrator to remove the block. 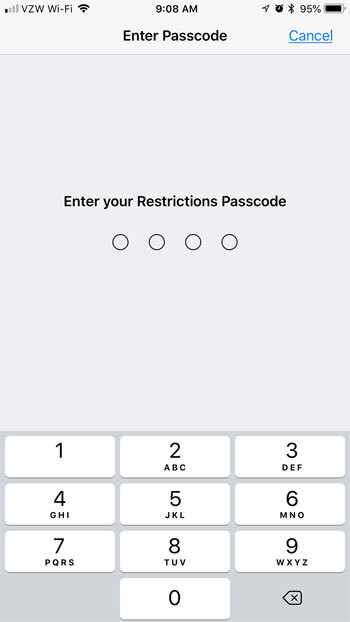 You will also need to know the iPhone’s Restrictions passcode to complete these steps. Step 3: Scroll down and choose the Restrictions option. Step 4: Enter the Restrictions passcode. Step 5: Scroll down the the Allowed Content section of the menu, then tap the Websites button. Step 6: Choose the website that you want to unblock from the list under the Never Allow section of the menu. 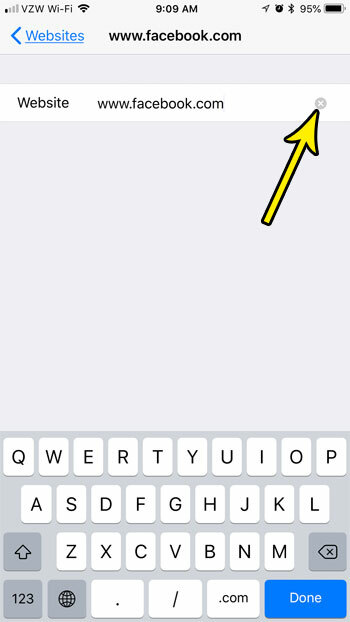 Step 7: Tap the x to the right of the website to remove it from the block list. 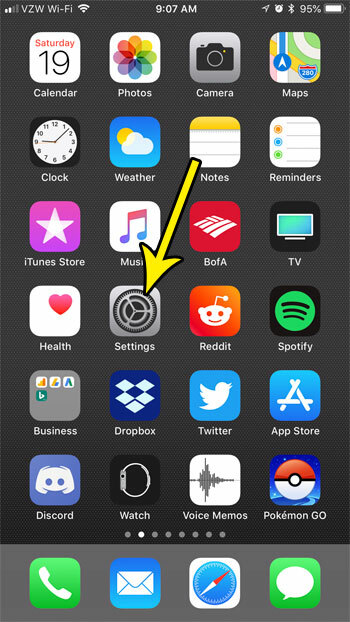 If you would like to unblock all of the sites that are currently blocked on your iPhone, choose the All Websites button at the top of the menu shown in Step 6. Is your iPhone almost out of storage space? Find out about several ways that you can free up some storage space and make it a little easier to manage your apps, pictures, videos, and more.